Everybody knows Camarillo, CA-based Rat Sound. The company was co-founded by Dave Rat in 1980, largely to serve the growing market for touring punk bands. And since then, Rat Sound has expanded into one of the country’s major providers of sound for stadium and arena tours and events of all sorts — including two decades of serving the massive Coachella Music Festival. Less known is that Rat Sound’s sales dept. (Rat Sound Sales) sells 100 brands of pro audio, as well as useful items for live sound pros, manufactured in-house by its SoundTools Division. One of the most popular devices in its SoundTools line is the Rat Sniffer/Sender, a simple, low-cost, two-piece unit developed by Dave Rat in 1996 that offers a fast, easy, convenient means of testing XLR cables and snakes. I’ve been using a well-worn Rat Sniffer for at least 15 years (maybe 20?) and it’s an indispensible part of my kit. More recently, Rat Sound has developed other Sniffers for ¼-inch, NL4 and 5-pin DMX lines. The CAT Rack puts 12 XLRs in a convenient rack package. The latest addition to the SoundTools series is the CAT Family, a variety of snake items for use with shielded Cat-5/5e/6/7 lines, as well as two families of Cat-5e cables with Neutrik etherCON terminations. Although the products are based on Cat-5 cabling, this is not a routing or snaking system for moving/distributing Ethernet data, but rather using high-quality, shielded Cat-5/5e/6/7 lines in lieu of traditional audio snake cables. There are some limitations here — using the SoundTools CAT Family peripherals, a single Cat-5 cable can only carry four channels of balanced analog audio (including phantom power), or four AES stereo pairs, four com lines for 3-pin XLR-based (Clear-Com style) intercom lines or four (5-pin) DMX data streams. The system is entirely passive — there are no electronics, buffers or amplifiers along the way. It’s essentially a straight-wire connection. The “secret” is the system requires a shielded interconnect cable that meets Cat-5e specs (or better). The wire has to be good quality — Rat Sound uses 26 AWG copper with quality shielding. No mystery here. The WallCAT offers a simple installation solution. The simplest iteration of the CAT Family system would be a single etherCON cable, two CAT Tails (one for each end of the “snake”) that are Cat-5/etherCON breakouts with a female RJ-45 receptacle that fans out to four 24-inch XLR cables. In versions with four XLR terminations (male or female), the CAT Tails are $150 each. 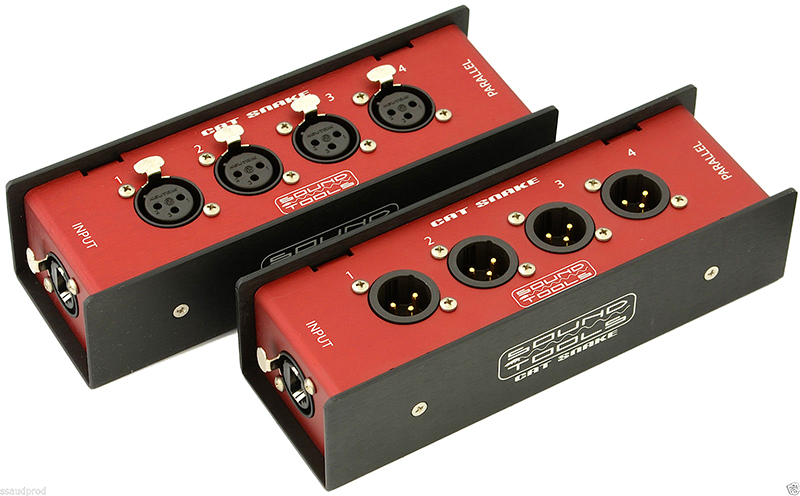 Also available are the SoundTools CAT Box stage boxes ($120/each), which use a rugged aluminum housing with RJ-45 jacks at either end (for in/out and parallel cable connections) and four male or female XLR jacks. It basically looks like a mini-stage box (and certainly could be used as such). One CAT Box function not often found on most snakes is a small — thankfully recessed — switch for ground lift. I didn’t encounter any applications where I needed to use it, but it is nice that it’s there. The CAT Box can also be used on its side, so the XLR cables lay flat for a clean look and to reduce tripping hazards. One thing about the CAT Box that I didn’t like was its lack of feet or a rubber under/side pad to prevent it from sliding around and/or scratching the stage floor. Fortunately, I had some unused stick-on rubber feet that came with some rack item and those did the trick. 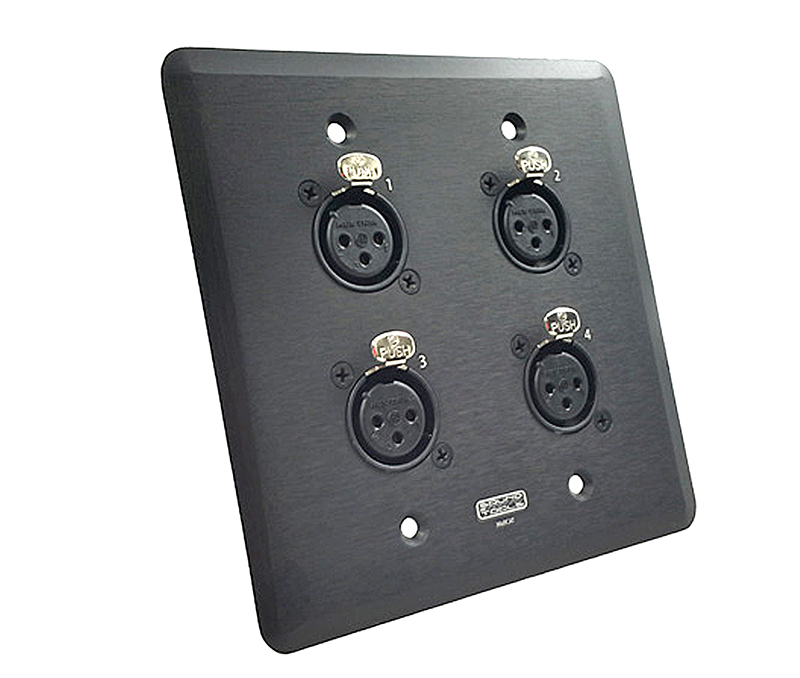 Designed for installations, the SoundTools WallCAT ($50) puts four XLR’s (male or female) onto a wall plate that fits a USA standard 4×4 electrical junction box. Installation is easy — once the Cat-5 line is in and RJ-45 terminated, the line merely plugs into one of the two jacks (input and parallel, if needed) on the rear of the plate. The big kahuna in the line is the CAT Rack ($250), a single-rackspace that puts the equivalent of three CAT Box units into a single enclosure with 12 XLR inputs or outputs, fed by three separate Ethercon cables on the rear side. Custom configurations are also available. Rear parallel RJ-45 connections allow daisy-chaining/multing units and the CAT Rack ships with reversible rack ears, so either the XLR or RJ-45 connections can face forward. SuperCAT cables are offered in “Entertainment” and “Lite” grades; long cable runs are delivered on a cable spool. To accompany the CAT Series, RatSound also debuts a line of high quality Cat-5 cabling. Both are SuperCAT products, one is the “SuperCAT Sound” (Entertainment Grade); the other is “SuperCAT Lite.” All use high-quality 26 AWG cable with Neutrik etherCON terminations, but the Entertainment version — is a U/FTP design, comprised of 12-conductor cable with four twisted pairs each having individual shield drain wires — that exceeds Cat-7 specs and is intended more for touring and rigorous portable use. The “Lite” cable is a 9-wire S/UTP design having four twisted oxygen-free copper pairs surrounded by a braid shield. With its smaller diameter and polyurethane jacket, it feels and coils more like a standard pro mic cable. Pricing for the Entertainment Grade ranges from $123 (50-foot) to $846 (330 foot); the Lite versions range from $62 (25-foot) to $531 (330-foot); all have Neutrik etherCON plugs (unterminated and custom lengths are also available) and longer cables are supplied on cable drums. I liked the CAT system. It offers a variety of peripherals that are versatile enough to meet a lot of production requirements. The components are a bit pricey, but the build is solid and they deliver exactly what they promise. I had no issues with the cabling; and with the rise of demand for quality Cat-5/5e/6/7 to move data at venues and portable events, either the Entertainment or Lite grades can fit the bill. 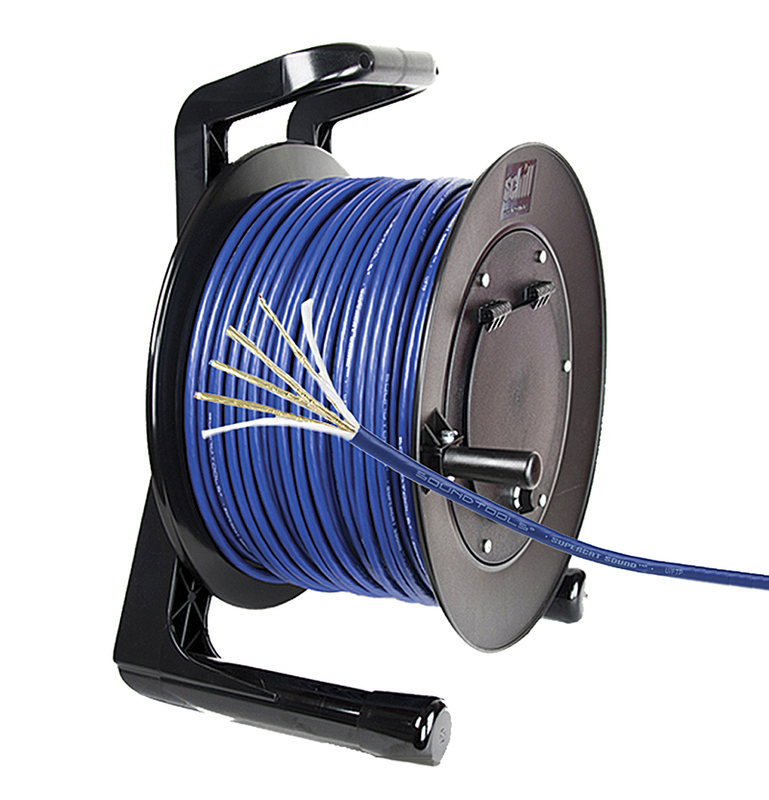 In fact, the ease of coiling and using the Lite cable make it an affordable, attractive choice in all but the most interference-prone applications. Rat Sound’s SoundTools RatCat Series, including the company’s CAT Tail, CAT Box, WallCAT and CAT Rack, is a versatile 4-channel interfacing/snake system using shielded Cat-5 cabling for analog, digital, DMX and comm signals. Cable can be used for analog/AES/com/DMX snaking one day, and run network data (Dante, etc.) the next. Prices: CAT Tail, $150; CAT Box, $120; WallCAT, $50; CAT Rack, $250; cabling varies by length and grade.